The rich calendar of afternoon and evening initiatives at the archaeological site of Canne della Battaglia kicks off on Saturday, 21 July. Admission free of charge. Guided tours, educational workshops, hikes, yoga, star gazing, concerts and theatre organised by the Polo Museale della Puglia together with the Cultural and Tourist Industry Department of the Region of Puglia, the City of Barletta and the Teatro Pubblico Pugliese – Regional Consortium for the Arts and Culture. It all starts on Saturday, 21 July with an archaeological hike and extended evening hours for the site until 9.30 PM. On 2 August, the anniversary of the historic battle between the Carthaginians and Romans, there will be a performance of Stefano Luci’s ‘Addio nuvole … ovvero la guerra di annibale barca’ (Farewell Clouds … or the War of Hannibal Barca), a story about the Second Punic War told from the point of view of the losing side, for learning about two different cultures with references to the contemporary world. 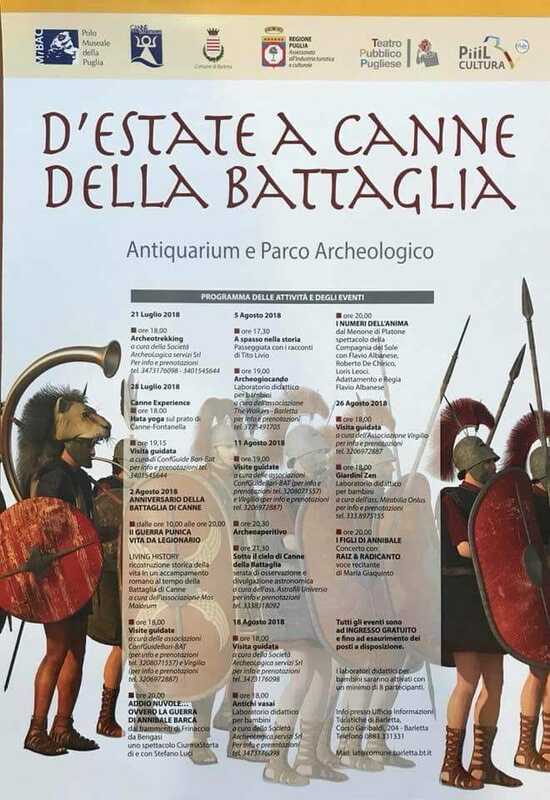 Also on 2 August, ‘Il Guerra Punica – Vita da legionario’ (The Punic War – The Legionnaire’s Life) will recreate the activity in a Roman encampment at the time of the Battle of Canne, using a historical reconstruction proposed by the association Mos Maiorum. An especially interesting event will take place on 11 August: star gazing with telescopes, led by Vincenzo Coppa from the Associazione Astrofili Universo, who will talk about the sky and stars. On 18 August, the Compagnia del Sole, winner of the 13th edition of the Eolo Awards in the Best Show category, will stage ‘I numeri dell’anima’ (The Numbers of the Soul), based on Plato’s Meno. A focus on history will return on 26 August with Radicanto and Raiz, the singer from Almamegretta, with the concert ‘I figli di Annibale’ (The Children of Hannibal).